All Is Calm. Dan Norman photo. As I was looking back on the theater I’ve seen, like many, I wanted to make a list of those that stand out in my memory. Here’s my list of the most memorable productions in Connecticut and NY. (A caveat: I see a lot of shows in Connecticut, but not all and many in NYC but only a small percentage of what is offered, particularly off-Broadway.) This is list is based on shows I saw in 2018 – they may have opened officially in December 2017 and some current shows I’m not seeing until January. (Specifically Ferryman and To Kill a Mockingbird). A Lesson from Aloes at Hartford Stage. I had not seen this Athol Fugard play about the costs of political dissent since it premiered at Yale Rep in the 1980s. I had fond memories of how moving I had found it. I wondered if I would have the same reaction now. I did. Darko Tresjnak directed this with care and had a fine three person cast. In so many ways it proved to be a play that continues to be relevant. Age of Innocence at Hartford Stage. This stage version of Edith Wharton’s classic novel about high society in New York City at the turn-of-the last century, was beautifully acted, directed and had gorgeous sets, costumes and lighting. Boyd Gaines gave a terrific performance. Drowsy Chaperone at Goodspeed. It was light, fluffy, silly and totally delightful. What more do you need? El Huricán at Yale Rep. This world premier used the hurricanes of south Florida to illuminate the issues of loss, memory, aging and immigrants. It managed to be touching but not sentimental. Father Comes Home from the Wars at Yale Rep. The play by Suzan-Lori Parks uses the Greek story of Homer to tell the story of a slave who fights for the Confederacy. She wove the Homerian references beautifully into this story. Fun Home at MTC (Music Theater of Connecticut). This is a small theater with a limited budget but director Kevin Connor seems to have a gift at taking larger musicals and downsizing them in a way that doesn’t harm the work. This production of the Tony-winning musical (the first by a regional theater in Connecticut) worked even better with the audience so close to the performers. Hamilton at the Bushnell. I don’t often include touring companies in my list, but you cannot ignore Hamilton. Some who saw the original cast had quibbles with some of the acting, but for the rest of us, it met expectations which were very high, indeed. Man of La Mancha at Westport Country Playhouse. Mark Lamos showed us once more why he is a sought out director of not only plays but musicals and operas. This was a touching production of a show that many are bored with. Murder on the Orient Express presented by Hartford Stage. It wasn’t their production but it was stylish and delightful. Thousand Pines at Westport Country Playhouse. This new play ended the season and it was a fascinating look at dealing with grief and the unimaginable. It was also the last work that Alvin Epstein directed. Turning to NYC, here are my top 10 in alphabetical order. All Is Calm, off-Broadway. 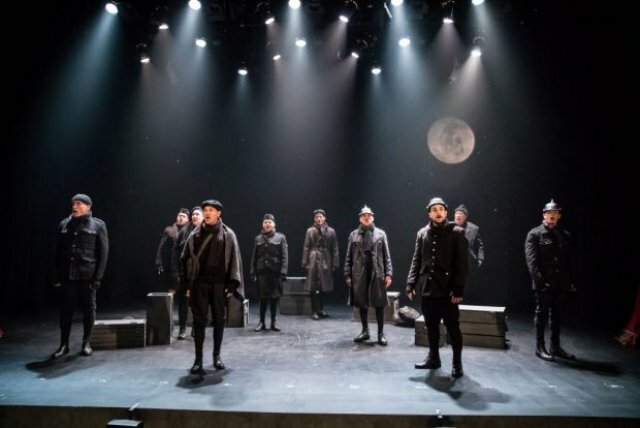 This telling of the soldiers’ Christmas truce in December 1914 was done simply with a fine cast and music of the period. It was a touching reminder of what the holidays are all about: Peace. Final Follies, Primary Stages, off-Broadway. Three one act plays by A. R. Gurney from different periods of his career proved once again how insightful he was about human nature. Lifespan of a Fact, Broadway. What is a fact? With “alt facts” current in our news discussions, this play illuminates the art of fact-checking. Plus it brought Cherry Jones, Daniel Radcliffe and Bobby Cannavale back to Broadway. My Fair Lady at Lincoln Center. It was a glorious production directed by Bartlett Sher that brought out the modern elements of this classic musical. On Beckett, Irish Rep, Off-Broadway. Bill Irwin gave an acting class as he discussed, illustrated and enlightened us about his love affair with Samuel Beckett’s works. Brilliant. The Prom, Broadway. A brand new, totally original Broadway musical. It was funny and touching and great fun. Stories by Heart, Roundabout Theater. John Lithgow didn’t just tell us stories, he made them come to life, once again showing why he is one of American’s best actors. Three Tall Women, Broadway. Any show that brings Glenda Jackson back to Broadway is worth seeing. But this production of the Edward Albee play was equal to her talents. Travesties, Roundabout. Some people found this Tom Stoppard play tedious but I have always enjoyed the intricacies of combining real people with the fictional. The entire cast was terrific. Waverly Gallery and American Son, Broadway. These tied in my estimation with a slight edge to Waverly Gallery with Elaine May, Lucas Hedges and Joan Allen. American Son had incredible acting but the play itself has too many flaws. Limiting myself to just ten shows, means I left out some very excellent and enjoyable productions from Westport’s A Flea in Her Ear, TheaterWorks’ Hand to God, Ivoryton’s The Fantasticks, Playhouse on Park’s The Revisionist, and others. Courtesy of Two on the Aisle.